As Opening Day approaches, many team’s rosters have rounded into place. However, there is some slight tinkering to be done. With this in mind, let’s consider the careers of two players, blindly — one of whom is a mainstay for his team and the other who used to be. Both players converted from shortstop to center field. They’re almost the same age. Player A was once a top-25 prospect, however, while Player B was a relatively unheralded signing out of the Dominican. Now, Player A is his team’s unquestioned starting center fielder, while Player B is on the trading block. Player A is Billy Hamilton, noted speedster, while Player B is Juan Lagares. Recent reports suggest that the Mets have received interest in Lagares and that the club is motivated to move him. Now, this could be the case for a variety of reasons. Lagares hasn’t hit particularly well this spring, going just 7 for 36 so far with 13 strikeouts. While spring stats only correlate so well to regular season, Lagares hasn’t made an overwhelming case for an expanded role. Lagares also makes $6.5 million this year and $9 million next year, and the Mets have supposedly been interested in shedding some payroll. Finally, there’s the fact that Lagares — one of the best defensive center fielders in baseball — is buried on the Mets’ outfield depth chart by a bevy of corner outfielders masquerading as center fielders. The fact that he is available should pique the interest of many teams, just as much if Billy Hamilton was available. If you asked the average baseball fan to compare the respective trade values of Billy Hamilton and Juan Lagares, chances are the former would be more highly coveted. This may be only because they have actually heard of Hamilton, the fastest — or second-fastest — man in baseball. Hamilton’s range in center field and prowess on the basepaths is well known throughout baseball. Lagares meanwhile, hasn’t received 400 plate appearances in a season since 2015. Nevertheless, these two players are more similar than different in the overall picture of value to a team. At the plate, it’s hard to argue that either player is a force to be reckoned with. Neither walks much or makes contact much more frequently than average. Both possess little to no pop. However, Lagares still profiles as a better bat, projected at 80 wRC+ by Steamer, while Hamilton checks in at a projected 70 wRC+. Even looking at the deeper data, one finds that Lagares averaged 84.7 mph off the bat in 2017 (388th in baseball), while 21.8% of his balls in play exceeded 95 mph. Hamilton, on the other hand, averaged 79.3 mph (512th) with only 10.3% exceeding 95 mph. Of course, where Hamilton has Lagares is in the speed department. Hamilton had the second-highest sprint speed according to Statcast last year — 30.1 feet per second, behind only Byron Buxton — and has stolen 243 bases and added over four wins in baserunning alone over his career. Lagares, while not a liability in this department — he recorded the 92nd-best sprint speed at 28.2 ft/sec last season and has been a net positive on the basepaths — can’t compare with that. The thing is, even Hamilton’s superiority on the basepaths only brings him relatively even with Lagares in terms of the overall offensive profile. Over their careers, Hamilton and Lagares have put up -31.2 and -27.1 runs of offensive value, respectively. Last year, Lagares cost his team only five runs of offensive value relative to average over 272 PAs, while Hamilton cost the Reds 18 runs over 633 PAs. Over 600 PAs for both players, Lagares is still costing his team 5.5 fewer runs (-11.7 vs -17.2 offensive value per 600). The center-field defense of Juan Lagares is nearly unparalleled among current major leaguers. That brings us, finally, to their defense — the real strength of each player. Lagares won a Gold Glove in 2014, while Hamilton has yet to be honored in his career. Even so, there is no doubt that this pair represents some of the most elite defensive talent in baseball. According to Statcast, Hamilton recorded 10 Outs Above Average in 2017, good for ninth in baseball. Lagares, meanwhile, recorded 7 Outs Above Average (18th overall)… in fewer than half the innings. Looking at Catch Percentage Added, we find that Lagares outpaced Hamilton on the season — although, again, they both rank as elite in that category. Over their careers, Lagares has actually added more defensive value on a per-inning basis than Hamilton. So, we seem to have two players who possess comparable toolsets — offensively challenged, defensively stellar — but are valued differently by their clubs. Why? 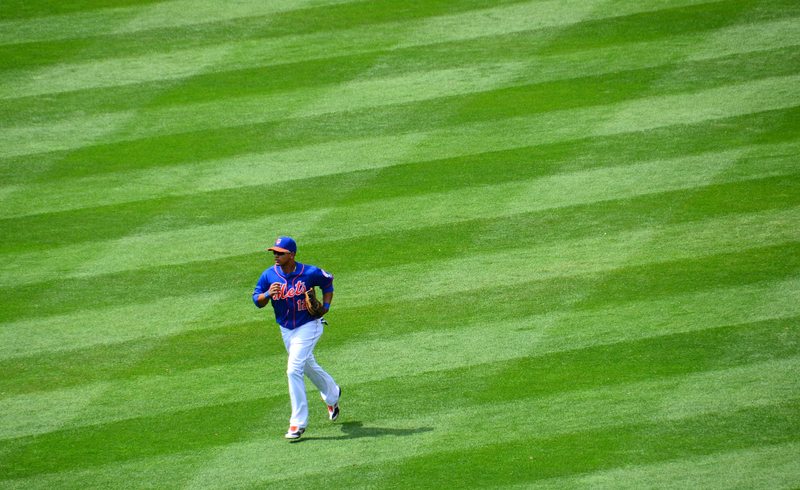 It’s a difficult question, but Lagares does have a few things going against him. Lagares missed significant time in 2016 and 2017, dealing with a torn ligament and broken interphalangeal joint in his left thumb. In addition, Lagares’s contract ($15.5M over the next two years) isn’t as friendly as Hamilton’s ($4.6M in his second arbitration year). But even then, Lagares would have to put up only two wins to be worth that deal, something that would seem reasonable on his defense alone. Who should call the Mets to inquire about Lagares? Well, everyone should be interested in one of baseball’s best defensive outfielders, so let’s rephrase the question: who would call the Mets? Why not the Indians, where he could provide the weak side of the platoon — and valuable depth — for Michael Brantley or Bradley Zimmer? The Orioles, who have had the defensively inferior Adam Jones patrolling the outfield, could benefit from some defensive assistance, too. MLB Trade Rumors notes that the Rangers, Tigers, and White Sox as potential fits, as well. There are a number of other clubs across the majors who have a need that Lagares could fit. Even with his flaws, Lagares is a player who can provide value in excess of his contract to a team. He might not be the piece, but he can be a guy. You wouldn’t give up the farm for him, but he still is worth something. It would behoove teams to at least give the Mets a call to see what the team’s fourth outfielder (When everyone is healthy) is worth. Under the right circumstances, a team might just find itself a relative bargain. We hoped you liked reading Juan Lagares and the Power of Perception by Stephen Loftus! Don’t you mean the former? Yes, thank you for catching that. Should be fixed now. I noticed that as well. And isn’t it likely that baseball GM’s and analytics departments know that these two players are similar – unless there’s a reason to think that one may be more valuable if utilized differently (i.e as a baserunner or defensive sub)? Was reading that Billy Hamilton scores a very high % of the time when he gets on base – is that captured in the WAR calculation – his ability to be a pinch runner.